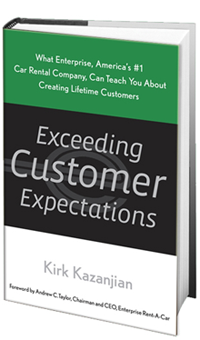 I just finished reading Kirk Kazanjian’s book Exceeding Customer Expectations which follows the humble beginnings of the 50 year old Enterprise Rent-A-Car business, which has grown into the largest and most profitable rental car company in North America. Jack Taylor, the corporate patriarch began his business in the basement of a Missouri Cadillac dealership, focusing on the common sense business decision to treat customers and employees very well. That teamwork eventually evolved into a company boasting 62,000 support personnel, 7,000 branches, and 800,000 vehicles. What do you think we do especially well? You don’t have to be perfect; you just have to handle problems promptly and appropriately. Included in the training were steps to turn angry customers around. Taylor assumed many customers when renting cars were on vacation, and he wanted people to remember their vacations with positive experiences. Employees were taught to listen with an understanding and sympathetic attitude and record or repeat back to the customer what had gone wrong. Employees were to apologize and find out what the customer wanted to make them feel better, and propose a solution. If the customer wasn’t satisfied with the representative’s solution, there would be more follow-up and to find a solution suggested by the customer that everyone could live with, with the final objective to make sure the customer never lost face. The Enterprise Way has been a cautious company growing with limited risk. On some long term leases, when opening a new office, the company employs the “JCT” clause (after Jack Taylor) which allows the company to get out of its lease with 90 days notice and three additional rent payments, and although the economy has hit every business hard, Taylor’s philosophy remains timeless. Bottomline: The book clearly explains starting and managing a company with practical and useful advice aimed towards customer service and employee satisfaction. The author’s logical sequence keeps you interested and entertained. Pros: The rags to riches with a practical and humble approach is inspiring. We all enjoy reading true accounts of customer centered companies and their rise to success. The book provides practical information for customer service employees. Cons: The book was copyrighted in 2007, and some of what was written seems out of date now. I have noticed in my own experience that Enterprise offices have been run down with less than stellar customer service representatives. Interested: Exceeding Customer Expectations is available on Amazon.com for $16.47. You can buy it here.